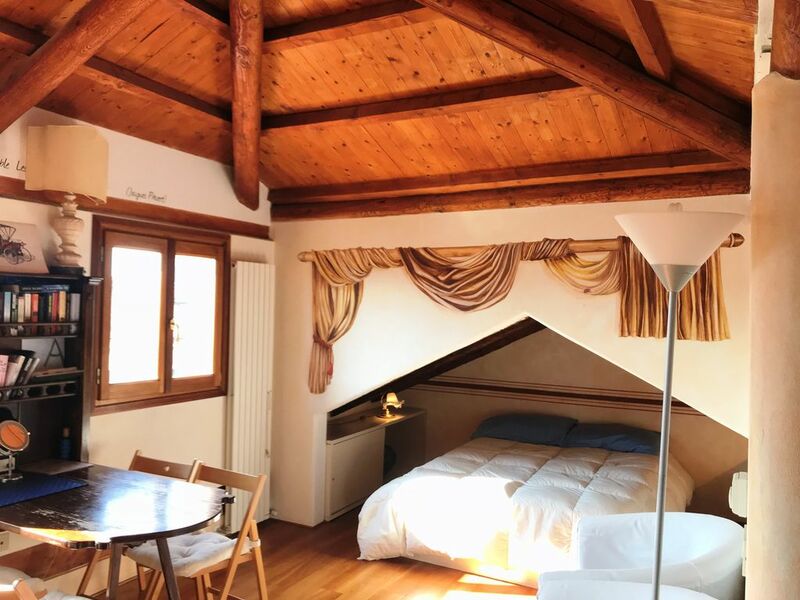 completely restored in 2010, very romantic, 10 min from Piazza S.Marco, view on the roofs, just above a romantic canal on which gondole go by. We had a wonderful few days in Venice made all the more special by this charming little roof top apartment in one of the most endearing sections of the city. Loved waking up and being able to gaze over the nearby canals. Highly recommended! Thanks dear! I am very happy you enjoyed my little Paradise! We spent two nights here and really liked it. The agent who met us was lovely and gave us a nice orientation to the area as she walked us in from our designated meeting spot. The location is so quiet but not a long walk from anything - in fact, our favorite coffee and gelato places were right down the street. But oh my goodness, the mosquitoes were horrendous and we didn’t ever have the windows open! I don’t know how they got in, but my husband and daughter were eaten alive on the last night. It’s amazing to me that window screens are not more prevalent in such a mosquito-ridden place! Great location Easy access and great apartment. We fell in love with the city instantly when we opened the windows to look out over Venice. The place has a lot of stairs to get up to the apartment, but it’s well worth it. Beds were comfortable and the place was clean. One thing to make it better would be an air conditioning unit as keeping the windows open made for a few mosquito bites and loud people down below at the restaurants. We would stay here again however. The apartment was great. 4th floor walk up provided some great views. Perfect for my husband and myself. Convenient to good food and not too far to the train station. Only word of caution, as a person 6 feet tall in height I hit my head on more than one occasion on the stairs. The room was cute and had a great view,. Unfortunately, it was too hot. The room was so hot that we had to leave and find an air conditioned hotel close-by after one night even though we had paid for two nights. There was a little air conditioner that didn’t work at all. We tried closing the windows and running the air conditioner , which made the heat even worse (as well as making the room claustrophobic). 5 Min from Vaporetto "Marcuola" and 15 min from the Train Station. A lot of small cosy restaurants just on the little canal, and the Tintoretto's famous "Maria goes to the Temple" at 5 min walk. Per arrivi tardivi (dopo le 20) un sovrapprezzo di 50€ da consegnarsi all'agenzia all'arrivo sarà richiesto For late arrival (after 8.PM) an extra fee is asked of 50€.